Roller Bearings are a style of rolling-element bearing which makes use of cylinders (rollers) so as to maintain the spacings between the moving and revolving parts of the bearing (rather than using actual balls as the rolling elements). Roller bearings are used to reduce rotational friction and to support radial and axial loads. 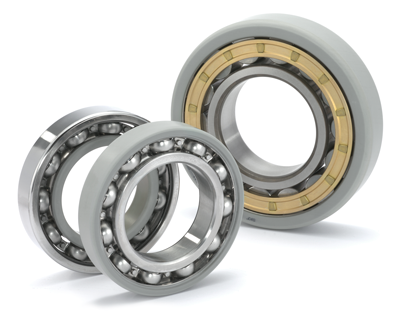 In direct comparison to ball bearings, roller bearings are able to support heavy radial loads and limited axial loads (in parallel to the shaft). They are also able to operate at moderate to high speeds (however maximum speeds are normally less than the maximum speeds of balls). When using roller bearings lubrication is important and must be carefully considered at an early stage, typically during the design phase. If you aren’t sure what you need, or require a little help in choosing the right products for your specific scenario, please remember that this is all part of the service provided by Hunt Bearings.